When I first decided to teach with Youth of Abraham, I was nervous because it is so driven by spirituality, which can lead to difficult conversations (on top of that, I am not a particularly spiritual person myself). Nevertheless, I decided to challenge myself with it, leading an inquiry-based session with the education department. The session was surprisingly successful, so I later used Youth of Abraham with college education students and found myself in one of the best conversations I’ve ever had about a work of art. There is just something about this painting. Although I say hello when I pass it in the galleries, I’ve never spent more than a few solitary minutes with Youth of Abraham. This Slow Art session was the first time I sat with it for an extended period of time. I’m not actually even sure how long I sat there–unlike my previous slow art sessions, I didn’t look at my watch once. 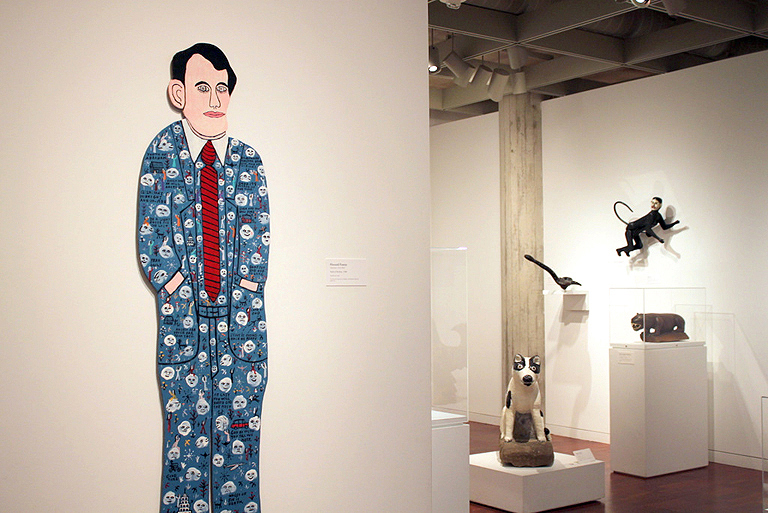 Gallery view of Howard Finster, Youth of Abraham, 1988. Acrylic on wood. Milwaukee Art Museum. Gift from the collection of Isabelle and Herbert Polacheck. Photo by the author. This art work is slim. It is acrylic painted onto a wooden cutout of a male figure wearing a suit covered with a detailed pattern of words, figures, faces, places, and objects. I become immediately sucked in by the figure’s eyes, those wide, unblinking, concentric pupils looking right at me, lashes underlining only the lower lids. I look away only to see Edgar Tolson’s Rock Dog staring at me with those same huge eyes, and decide I find Finster’s figure somewhat more comforting. So I settle back into slowing looking at the work. I’m overwhelmed and need some structure, so I identify that there are two separate things going on here: the cutout figure of the man, and the intense pattern of his suit. Since the guy is just staring at me, blocking me from figuring him out and making me feel a little uneasy, I focus instead on the pattern, deciding to categorize every single little thing that is going on. The pattern moves before my eyes against the bright blue suit. Faces, painted on fluffy clouds (perhaps sheep? ), scatter around in happy, upset, and mute side profiles. Simple figures, dressed in robes of different colors, stand with arms outstretched. I see bunches of flowers, birds tossing themselves through the air, stars sprinkled with glinting rays, dogs and deer leaping across the field of blue. And there are inanimate things too: vehicles and buildings, structures that seem dead and lifeless, red barns and churches with archways that pile on top of each other like a ziggurat. 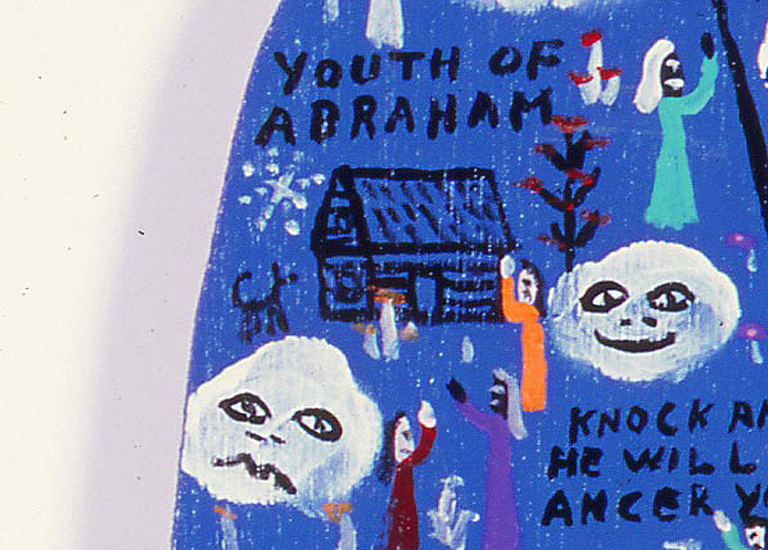 Howard Finster, Youth of Abraham (detail), 1988. Acrylic on wood. Milwaukee Art Museum. Gift from the collection of Isabelle and Herbert Polacheck. Photo by the author. I start to trace the colors, how the robes and flowers change from brightly colored turquoises, oranges and purples at the top, to duller burgundies and flat whites at the bottom. As I’m mapping, I get tossed suddenly out of the pattern by the figure’s pale pink wrists. I’m jarred, annoyed. I blink, feeling like I just stepped into the glaring sun after being in a dark interior. 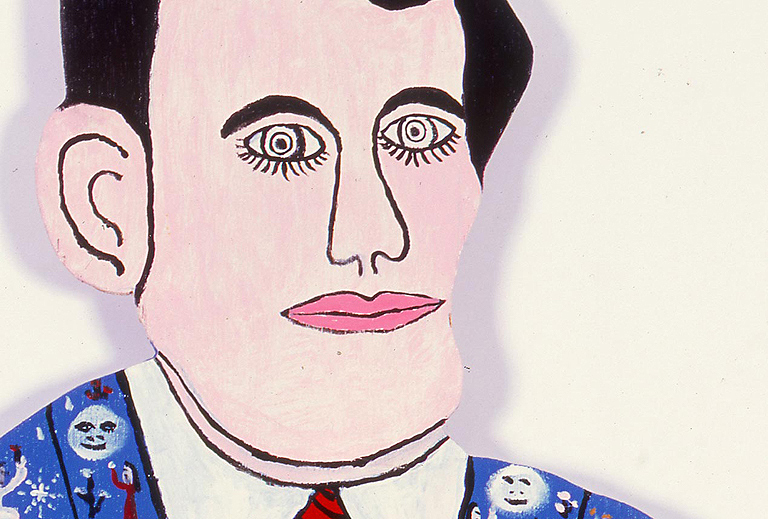 I recall a key fact I know about Howard Finster–he was a preacher who didn’t begin to make works of art until he was 60 years old, when he heard a voice in his head entreating him to “paint sacred art” (Turner, 3-4). Knowing that, these snippets of text, instructions, advice, and decrees all over this suit take on a poetic rhythm as I read them silently to myself. I move from positive declarations on the blazer (“seek and you / will find”… “angels are / never far / from thee”) to disturbing admonishments on the legs (“Jesus is coming / back be ready”…”wages of / sin is / death”) to somewhat reassuring parting words at his feet (“Jesus / saves”… “take / time to / be holy”… “God is / love”). I suddenly feel lost and confused. (Strangely, not enough to start looking at my watch; I couldn’t tear my eyes away.) I try desperately to figure out what the connection is between the figure of the man and the pattern on his suit. He must be the Abraham in the title, right? What is the story of Abraham, anyway–wasn’t he the guy from the Old Testament whom God asked to sacrifice his own son? What is the purpose of the text–or is there even one? Are they just random thoughts, written without premeditation, just because he needed to get the words out of himself and into the world, no relation from phrase to phrase? I know that can’t be right; there must be some reasoning here. 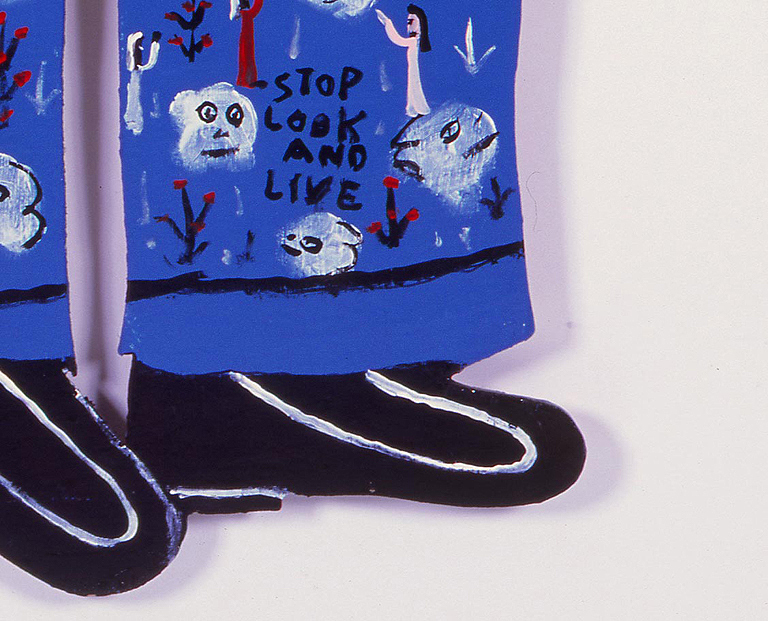 I see the feet, the shoes, and the final instructions–to “stop / look / and / live”. I let my mind wander. Is this a modern Abraham? Abraham, the patriarch of the Old Testament, father to so many important Biblical figures? Abraham in a business suit… And something begins to shift, slowly, into place. Has religion become a business? Is faith, written right onto the suit itself, a consumable object we buy and wear? A suit is something that can be taken on and off at our convenience, when we’re done dressing to impress. Is this a statement about those who are and aren’t believers? And yet–the youth of Abraham. After some research, I can find very little writing about his boyhood (the Bible seems to jump right into his middle age). 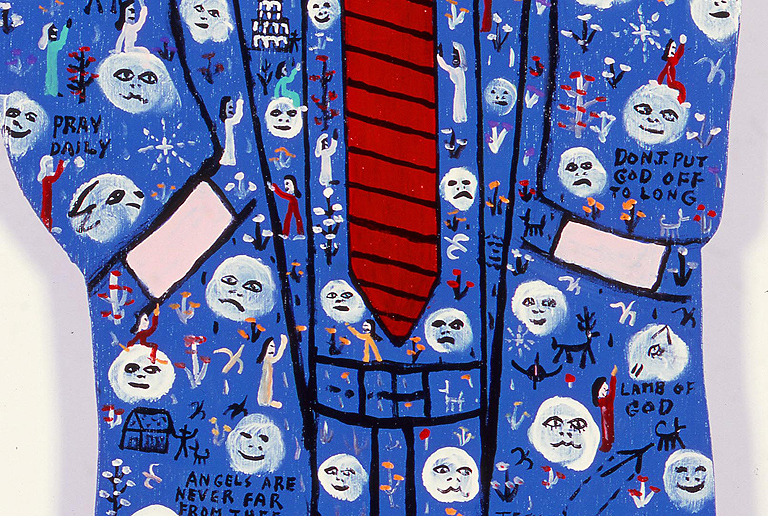 And here, in Finster’s work, is an enigmatic, blankly expressioned man, not old, but not a boy, with no seeming connection to the pattern on his suit, to the religious text and icons mixed in with lifeless structures. Was this what Abraham experienced as a youth, when he was first trying to understand his faith? No connection at first, and yet, perhaps he took “time to be holy”, he stopped, looked and lived, and found the deeper connection. Maybe he is a metaphor for those just discovering their faith; maybe it is youth not in the sense of age, but in its understanding of religion. Somehow, in this at first static image, I suddenly find emotional movement, paralleled by the pattern itself, moving from showy with its bright colors and multiple components, to a more muted, consistent feeling, one that is quietly matter-of-fact, maybe even optimistic. With work, with moving forward, understanding and wonder can be gained. Finster’s life’s work was to bring his visions to life through his art. I know I am not finished contemplating Youth of Abraham; even writing this blog post has pushed me further in my interpretation. So I’ll leave you with Finster’s own words: “I am leading the world to God. People are getting saved today, ’cause they are writing and telling me, ‘Howard Finster, we seen your work and heard you out. We’ve found a way of life. We are living happy now'” (Turner, 50). 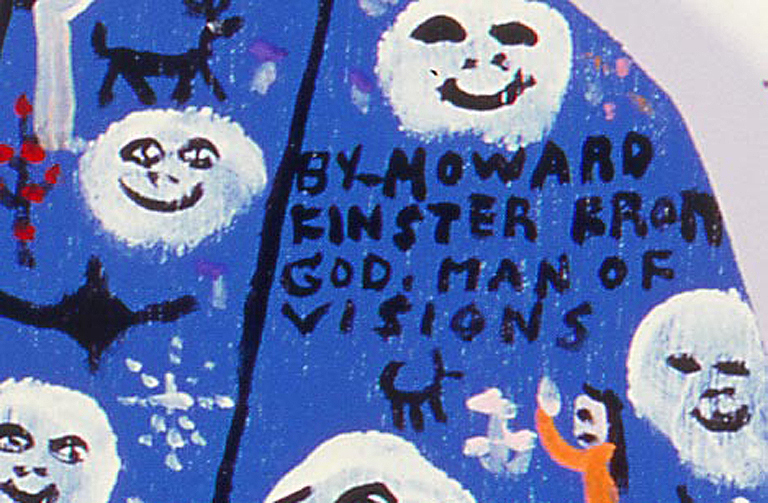 Reference: Turner, J. F. Howard Finster: Man of Visions. New York: Knopf, 1989. 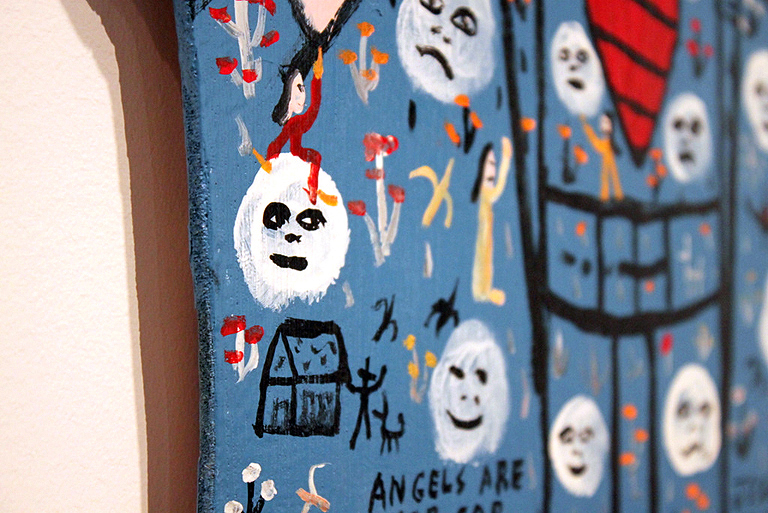 This entry was posted in Art and tagged Howard Finster, Outsider Art, Slow Art. Bookmark the permalink. Interesting. As unlikely as it seems, those shots reminds me a little of what Basquiat might do – albeit a little less wild and mad.